A school employee worked as a security guard, which required hours of standing or walking. The employee’s plantar fasciitis, however, made so much walking and standing difficult. As an accommodation, she requested that she be allowed to sit for 10 minutes per hour. The employee had taken leave because of her condition and had even filed a discrimination charge, based on age and sexual orientation. Needless to say, the employee and the employer did not have the best relationship. The employee sued, indicating that she was forced to resign as the result of ongoing harassment and failure to accommodate. The employer argued that the employee was not qualified for the position because she could not perform the job’s essential function of standing/walking. Generally, an employer’s understanding of the essential functions of the job is considered correct, unless the employee offers sufficient evidence to the contrary. The employee’s job description. The job description did not specify how much standing and walking was required, leaving that specific issue open to interpretation. It was not clear that a security officer who sat for a few minutes each hour could not perform the essential tasks. The employer’s opinion. The court found a question existed whether the administration actually enforced the no-sit policy or turned a blind eye to other security officers who continued to sit while on the job during the period in question. The amount of time spent performing the function. This was also disputed, with the employer contending that constant walking was required, and the employee and a coworker arguing that a security officer could perform the job effectively even when allowed to sit for short periods while students are in class. The consequences for not requiring the individual to perform the duty. Whether walking constantly reduced violence in the school, as the employer argued, was not an undisputed fact but an inference drawn from statistics. Past and current work experiences. There was evidence that security officers were allowed to sit for much of the time period in question and, even after that period, other security officers were allowed to sit without any consequence from the administration. Based on these facts, the court found that constant walking was not an essential element of the security officer position. Walking could be a very important part of the position, but a reasonable jury could find that needing to sit for a few minutes an hour while students are in class would not render an individual unqualified for the job. The job description in this case was not enough to support the employer’s argument. When taking all the other factors into consideration, employers can glean how to win such an argument. Ammons v. Chicago Board of Education, Northern District of Illinois, Eastern Division, No. 16-cv-4884, September 24, 2018. 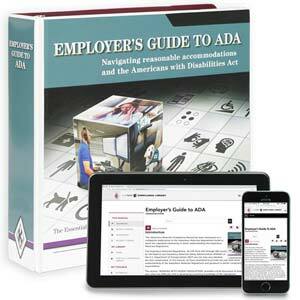 J. J. Keller's Employers Guide to ADA Manual helps you navigate the often-murky waters of the Americans with Disabilities Act (ADA).